Presented is a crusty looking model of a three masted full rigged ship flying the American flag with 30 stars. From the main peak she flys a pennant with the ship's name ALBUS, and on the forepeak flys a red pennant with a blackball called a house flag. ALBUS also appears on the trailboard of the starboard bow. PROVENANCE: Michael B. Gregory was born April 27, 1817 and wen to sea at an early age. He comes from a long line of seafarers and had a younger brother William D., seven years his junior, who also captained ships during the same period. 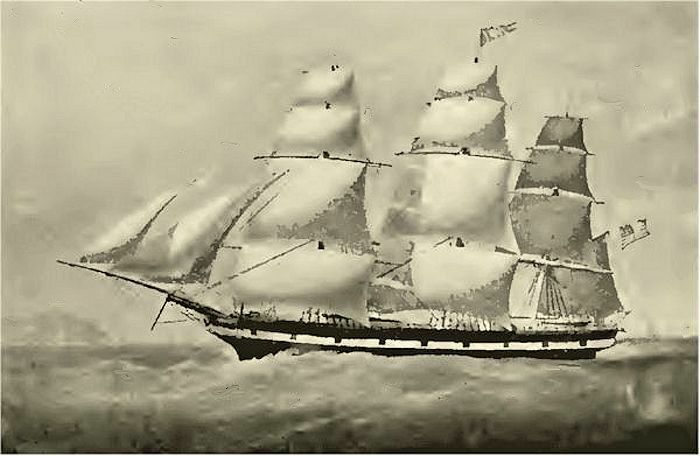 Michael's first recorded command was the Ship SUNNY SOUTH in 1853, and then successively, the ships, FRANCIS, WEST WIND, Brigantine MARY HELEN. In 1856, the ship NORWESTER, then the Ship MARY KIMBAL, Ship ALBUS which is noted as "Lost", but due to unrecorded circumstances. In 1860 he served in the Ship PEERLESS and then, in 1861, was commissioned a commander in the Union Navy and ordered to the Steamer R.B. FORBES as captain. REF: Old Marblehead Sea Captains and the Ships in which They Sailed. Compiled and published for the benefit of the Marblehead Historical Society, By Benjamin J. Lindsey, Treasurer, 1915. The painting of the ALBUS below was handed down in the Gregory family and shows the Black Ball line house flag with a swallow tail. CONSTRUCTION: The model was handcrafted in wood and is housed in a shadowbox or diorama. The hull and deck houses are made of block and the full sails are carved from wood that has been hollowed out to give them their realistic shape. The Colonial Blue background is without clouds or other embellishments giving the display a Folk Art appearance. The wood case is without glass, and set in what may be paper mache' to replicate the sea. It has a brown caste and a regimented set of a choppy sea. The sails are carefully carved out of wood and are a full compliment of light weather canvas consisting of a flying jib, outer jib, jib, and fore stays'l at the bow. The foremast carries a fores course all the way up to a Moon sail at the very top. There is a full compliment of stay sails between the main and foremast and and between the main mast and the mizzen mast..
Block waterline models of this type were made as a spare time occupation of sailors at sea. They varied in their exactness to the ship's design, since plans were not available, and in the quality of the workmanship. However, the sailors were exacting in the placement of the vessel's sails and rigging. This one seems to portray the vessel as she likely appeared, but was done in such a manner as to have a rustic appearance which is very appealing as a work of Folk Art. CONDITION: This model most likely dates back prior to 1859 and mostly shows age in the loss of paint on the inside of the shadow box. There is a prominent age crack on the left side of the backboard and at the upper right side where the wood has shrunk so the light shows through. There also is an accumulation of dust on the back of the sails which cannot be seen from the front. A 5/8 inch piece of wood has been added to the front edge to frame the box.